The New Standard Theatre, Shoreditch. 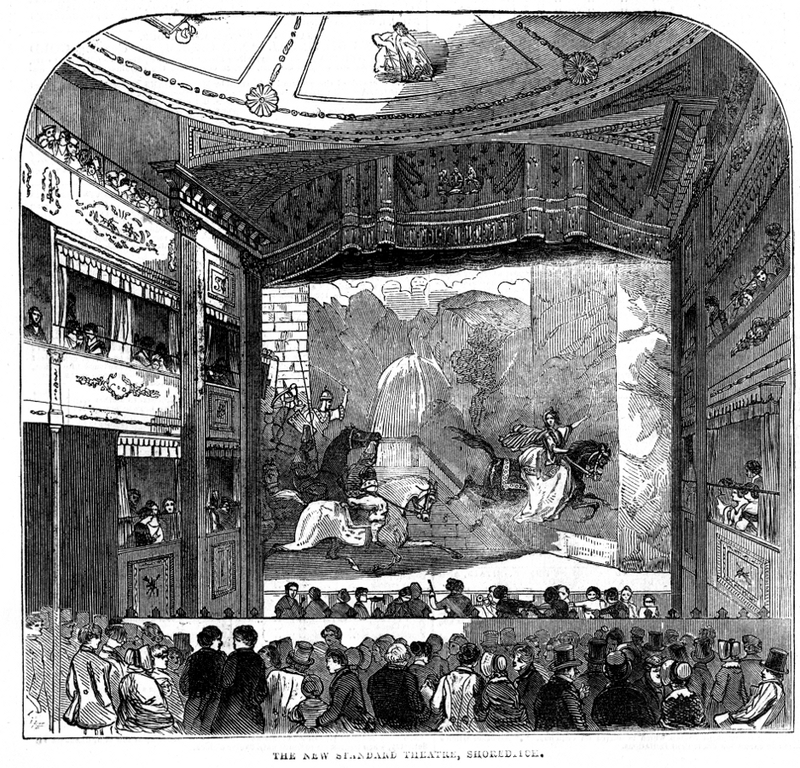 The East-enders have now their Amphitheatre, or Cirque Olympique, for equestrian performances, which the proprietors of the New Standard Theatre have just provided for in a novel and ingenious manner. This little Temple of the Drama was erected a few months since, on the site of twelve houses, adjoining "the Standard Theatre," by Mr. John Gibson, for the proprietors Messrs. Johnson and Nelson Lee. It faces the Terminus of the Eastern Counties Railway in Shoreditch. The interior is of the horseshoe form, and a domed roof, a construction peculiarly well adapted for the transmission of sound. The proscenium is 30 feet wide by 30 feet in height; the auditory has a circle of ten private, and fourteen public boxes, which, with the pit and gallery, will accommodate 2200 persons. It is lit by a cut-glass chandelier; the fronts of the boxes are coloured in two drabs, relieved with gold mouldings, pilasters, equestrian medallions, &c.
The equestrian performances were the holiday novelty of Monday last: they are not given in the area of the auditory but in the place of the stage; for which purpose the flooring is, by ingenious machinery removed upon a kind of railway, the proscenium boxes are made to recede, and a ring is presented 39 feet in diameter, wherein Mr. Cooke and his Stud first exhibited on Whit Monday. Our illustration is a scene from an Equestrian Spectacle, also then produced, and entitled "The Conquest of Tartary; or, The Eagle Rider of Circassia, and her Monarch Steed of the Desert!" wherein a Mrs. R. B. Taylor's performance is very striking.